It's summer in the wintertime in Argentina. Book a flight now, and bring an appetite. For the North American visitor, Buenos Aires seems remote, as if it were hanging off the edge of the world. To begin with, it takes 11 hours to fly there from New York, even though the metropolis is nearly in the same time zone. Upon arriving, I had the odd sensation I was standing upside down, maybe because the sun was always in the north instead of the south. This made navigating the ancient twisted streets in the older neighborhoods difficult during daylight hours; I’d often get the persistent feeling I was walking in the wrong direction–and usually was. The reversal of seasons is disconcerting, too, as if you were on another planet and saw two moons rising. 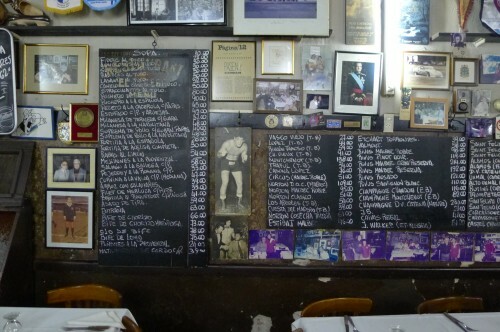 Nevertheless, Buenos Aires is fantastic. It’s partly a reverent ode to a Europe that no longer exists, for which its population of Spanish and Italian heritage still yearn. Row upon row of elegant townhouses, decorated with wrought iron and festooned with balconies, scream “Paris in the ’20s.” Indeed, the city is often called the Paris of South America. It displays a dash and elegance more common to Paris than Madrid or Rome. A companion and I recently visited there for a week to intercept some friends who’d driven down from San Francisco on their way to Tierra del Fuego, a journey that took them three months. After they’d ferried us from the airport into town—we were staying in an unbelievably cheap apartment in San Telmo, which is something like Bushwick and Greenwich Village combined—we explored dusty and somewhat faded streets that were washed in the wan light of early spring. Another thing that took some getting used to was dinner time. 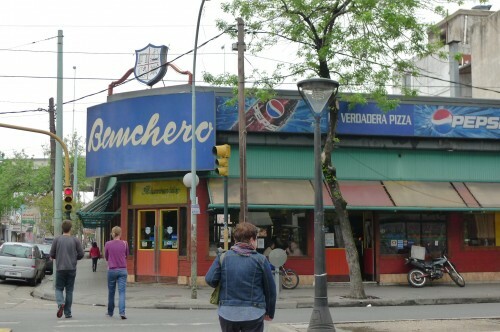 Few Portenos (“People of the Port, as Buenos Aires residents like to call themselves), would ever think about stepping out to dine before 10pm, and most restaurants don’t even open for dinner until 8. Hungry earlier in the evening, we found ourselves often the first diners waiting by the restaurant door to get in, joined almost exclusively by families with young children. Only by the time we were ready to leave did the restaurants begin to swarm with customers. The food was fantastic! In general, it was of a more limited range than I might have imagined, with grilled meats, pizza, pasta, sandwiches, and empanadas prevailing. 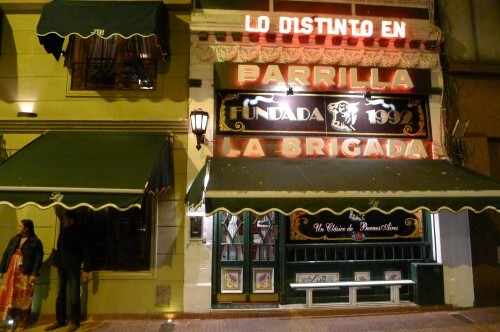 As such, my chums and I sought out the broadest range of places, especially historic examples of Spanish and Italian food that were preserved in BA’s older neighborhoods. Here are the best nine things we ate in a week of constant, peripatetic munching. 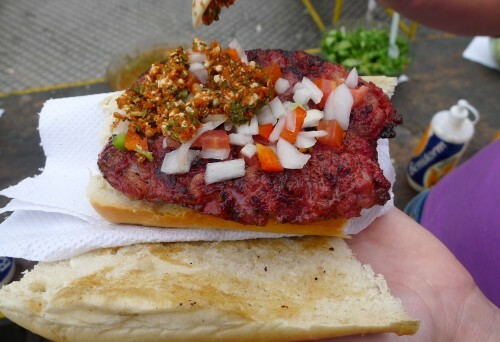 On a path that runs along the southern part of this wetland preserve along the Rio Plata are perhaps two dozens carts that charcoal-grill chorizo and thin-sliced sirloin steak and make them into sandwiches. The smell of smoked meats mixed with swamp is not to be missed. Spoon on the verdant relish called chimichurri, provided in several variations. 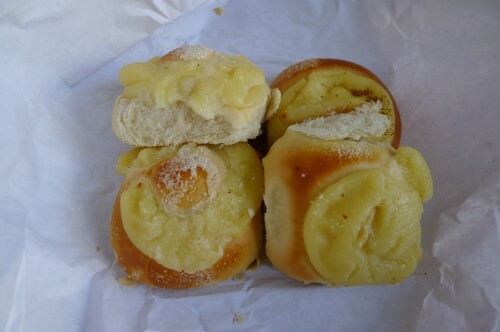 Variations on this pastry are found in most of the city’s bakeries—sweet buns with a cap of custard, utterly satisfying with a cup of coffee. A variation found at the San Telmo Market called an ensaimada is larger, and the custard not as rich, but the thing is still scrumptious. If only I could get this in the States!